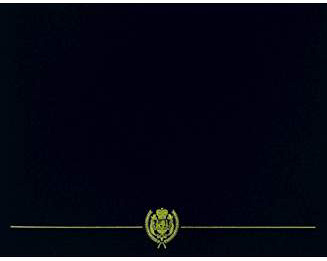 An unaltered photocopy of your DD-214, WD AGO, NAVPERS, NG or other military issued document clearly displaying your award of the NATO s.
The NATO Medal was established by the Secretary General of NATO, 30 July 1959. Presidential acceptance of the medal for the U.S. Armed Forces was announced in Executive Order 11139, 7 January 1964.
b. Awards. Awards are made by the NATO Secretary General, or in his or her name by officials to whom he or she delegates awarding authority. c. Presentation. Presentation normally will be made in the field by the Senior Representative of the Secretary-General who makes the award. When presentation is not so accomplished, any person who believes he or she is eligible for award may submit to Commander, PERSCOM, ATTN: TAPC-PDA, 200 Stovall Street, Alexandria VA 22332-0471, a request for such award with copy of any substantiating documents. Commander, PERSCOM will forward each such request through the Office of Internal Administration, Office of the Assistant Secretary of State for International Organization Affairs, to the NATO for consideration. Authorized by the NATO on July 30, 1959, and approved by U.N. Executive Order on January 7, 1964, this is awarded to service members who have served in the NATO for a period of six months with one of the following : NATO Observation Group in Lebanon (UNOGIL); NATO Troop Supervisory Group in Palestine (UNTSO); U.N. Military Observer Group in India and Pakistan (UNMOGIP); NATO Security Forces, Hollandia (UNSFH). Source: The provisions of Executive Order 11139 of Jan. 7, 1964, appear at 29 FR 227, 3 CFR, 1964-1965 Comp., p. 177, unless otherwise noted. By virtue of the authority vested in me as President of the United States and as Commander in Chief of the armed forces of the United States, I hereby authorize the Secretary of Defense, with respect to members of the Army, Navy, Air Force, and Marine Corps, and the Secretary of the Treasury, with respect to members of the Coast Guard when it is not operating as a service in the Navy, to prescribe regulations under which the NATO Medal and Service Ribbon may be accepted by members of the armed forces who have been determined eligible for consideration in accordance with the Regulations for the NATO Medal, promulgated by the NATO Organization on July 30, 1959. 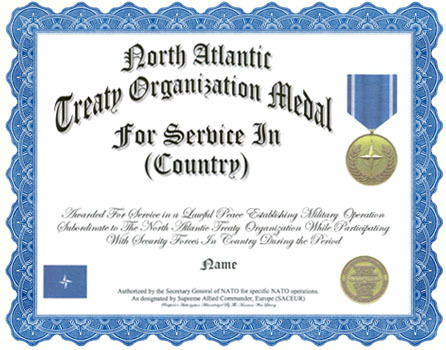 A determination that service with the NATO in a particular geographic area or for a particular purpose constitutes a justifiable basis for authorizing acceptance of the NATO Medal and Service Ribbon by eligible members of the armed forces of the United States shall be made with the concurrence of the Secretary of State. e. NATO Medal in the U.N. action in Korea and who are also eligible for the (1) Authorized by the Secretary General of the U.N. for specific U.N. missions and actions. E.O. 11139 (reference (kk)) authorizes the Secretary of Defense to approve acceptance and wear by U.S. Service members who meet criteria specified by the Secretary General of the NATO s. (2) NATO Medal (uNM) is an all encomp~sing term used to describe the basic bronze medallion, with the U.N. emblem and the letters U.N. on the obverse, suspended from a ribbon. (3) Each U.N. mission or action for which a UNM is awarded is commemorated by a suspension and service ribbon of unique colors and design. The ribbon and medallion combination take on the name of the specific operation for which the combination was created; for example, the operation in the former Republic of Yugoslavia is the NATO Protection Force (UNPROFOR), yielding the UNPROFOR Medal. (4) Procedures for approval, acceptance and wear of an UNM by U.S. Service members include: (a) The Secretary General of the U.N. will offer to award a UNM to the Secretary of Defense for U.S. participants in designated U.N. missions or actions, will provide specific award eligibility criteria, and will determine eligibility of individual participants. (b) The Secretary of Defense is approval authority for acceptance wear of UNM offered for specific U.N. missions or actions. A list of U.N. missions and actions for which the Secretary of Defense has approved acceptance of a UNM by eligible U.S. military participants is at Appendix 1. (c) If approved by the Secretary of Defense, U.S. Service members who meet the criteria may accept and wear the fmt UNM with unique suspension and service ribbon for which they qualify. To recognize subsequent awards (if approved by the Secretary of Defense) for service in a different U.N. mission or action, the Service member will affix a bronze service star to the first U.N. suspension and service ribbon awarded. (d) A UNM will normally be awarded by the Chief of the U.N. Mission to qualifying U.S. Service members prior to their departure from service with the U.N.